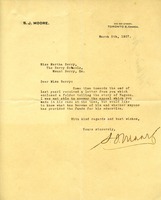 S. J. Moore writes to inquire with Martha what has become of Eugene, which she wrote about last year. 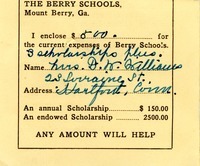 Mrs. D. W. Williams donates $500 to The Berry Schools. A donation to help with Eugene's education. 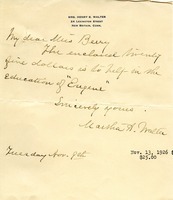 Mrs. Malcolm D. Sloane sends $150 in response to an appeal letter from The Berry Schools. The letter describes Eugene, a student working to become a minister, and asks for scholarship donations to help him succeed in school. 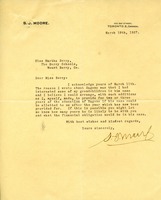 Sexton encloses a contribution in response to the "Eugene" solicitation. A story is told about Eugene and his struggles to attend school. Mrs. Sherlock sends a donation of $100. Appeal tells the story of a 23 year old man who wants to preach the gospel. Mrs. L. R. Morris gave $150 for an annual scholarship for Eugene. 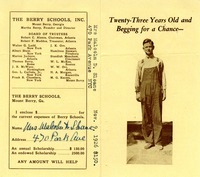 This donation of $25 is for a fund for a young man named Eugene so that he can go to Berry to become a minister. Mrs. F. A. Day donates $150 to the current expenses of The Berry Schools in response to an appeal letter about Eugene. Ely encloses a contribution for Eugene's scholarship. Written on the reverse of a scholarship solicitation. Martha Berry thanks Mrs. Eaton for her gift and discusses the school's policy of not giving student names to friends.